There’s so much on the internet about Chewing gums. Some people say they are beneficial, while some others say they can be bad for your oral health. Do we know the facts? Here’s what you should know. Improves Oral health- Few sugar-free chewing gums do have certain benefits like reduce cavities and plaque formation, whitens teeth and freshens breath. Improves memory- psychologists say that the continuous moving of jaw increases the heart rate and increases oxygen supply to the brain, which enhances our cognitive powers. 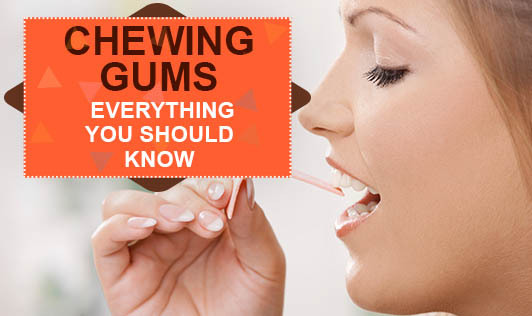 Reduces stress-Chewing gum is known to reduce stress and ease one’s mind. However, the exact science behind this is unknown. Helps manage weight- few scientists say it reduces craving for high calorie snack and burns about 11 calories per hour. Reduces heart burn- chewing gum makes one produce more saliva, which is alkaline in nature and this, neutralizes acid in the esophagus. Tooth decay-chewing gums that contain high amount of sugar can cause decay. Temporomandibular Joint Disorder (TMJ) - continuous and prolonged chewing of gums can cause pain in the jaws, neck, facial muscles and back as well. Wrinkles on the face-continuous chewing of gums can reduce the elasticity of skin and result in wrinkles. Increase gastritis-chewing gums contain powerful gastric juice. When chewed on an empty stomach, it aggravates gastritis and other stomach problems. Ingredients-ingredients like aspartame and other sweeteners are known carcinogens which are cancer causing agents. The first chewing gum is considered to be around 9,000 years old. Earlier, most gums were handmade; today gums are manufactured using machines. Humans are the only animals on earth who can chew gum. Chewing gum while peeling onions will prevent you from crying. In 1944, in Philadelphia, a man lost several teeth when a piece of gum exploded in his mouth. If you swallow a gum, it would not create any major health problem and would be out of your body in 72hrs. But care should be taken to avoid it.